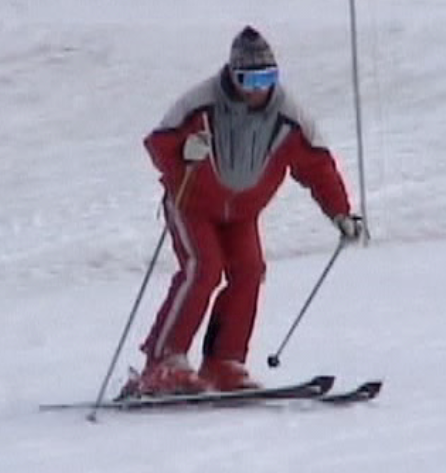 Simple, if you want to make sure you are flexing into the turn and tipping, before the uphill LTE ski goes downhill, lift the tip of the stance ski first . I have no problem lifting the tip in a turn, and keep it lifted thru out the turn, as I have done hundreds (thousands?) of javelin turns. But, I seem to lose some counter balance when I focus on lifting the indside tip... (one of my deep focuses this year is I am trying to ski steeper runs like Sweet and Sour and Steep and Deep, which are >35 degrees). To me, more counter balance and counter acting is THE secret to skiing the steeps. Is tip lift only relevant for a 1 footed release? Robert0325 wrote: Is tip lift only relevant for a 1 footed release? In a low speed TFR there probably won't be enough pop at the end of the turn to lift the tip of a weighted ski off the snow but you still flex the ankle and pull the ski back. Here's an old quote from the dorsiflexion thread linked earlier. Flex that ankle and pull the free heel back under the hips. Flexing the ankle is dorsiflexion and pulling the foot back is the hamstring based movement. 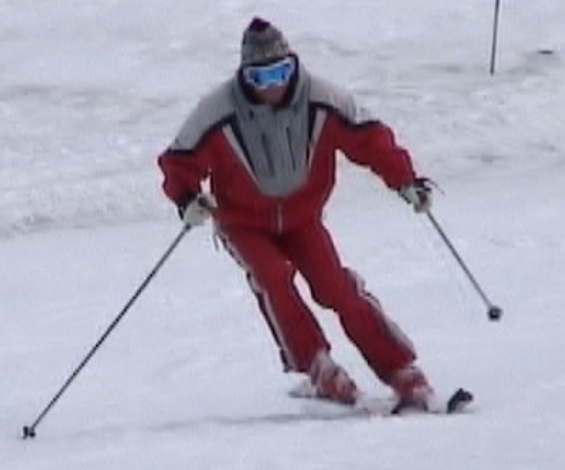 An expert level high speed two footed release can result in both skis coming off the snow in a tip to tail movement. 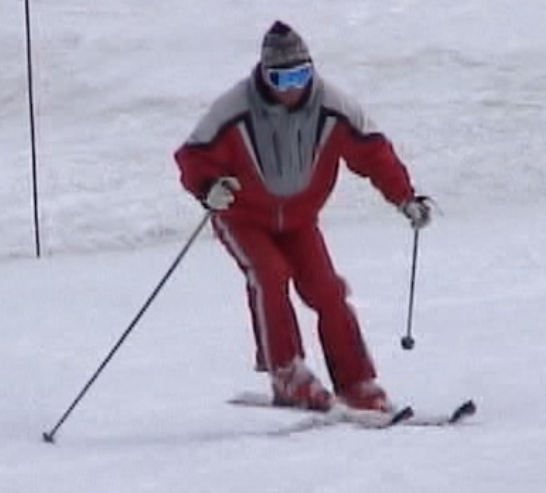 After reviewing more video I notice my tip lift is unconsciously happening while releasing every 3 or for turns. However the rest of the time when there is no obvious lift is present there is dorsi-flexion happening,. I know this because the tail does of the ski stays level, lift until after tradition. h.harb wrote: After reviewing more video I notice my tip lift is unconsciously happening while releasing every 3 or for turns. However the rest of the time when there is no obvious lift is present there is dorsi-flexion happening,. I know this because the tail does of the ski stays level, lift until after tradition. I tried tip lifting for the first time last weekend. The improvement in balance on the new stance ski LTE was obvious, as was the ability to begin the new CA immediately... simultaneous with tipping the free ski. I was happy (astonished, actually) that dorsiflexion allowed me to do something I was unable to do well at camp... Two Footed Releases from a stationary start. Not only could I do them, I could link them. Dorsiflexing while releasing let me link sloooww TFRs straight down the fall line for 500 vertical feet... dozens of them! I could have gone on forever, but I ran out of slope. I did notice that my foot pullback needs more work. Watching my tips, I had ~6" of inside tip lead on some turns. Not good. Getting to where HH is, virtually no tip lead, is going to take more work. Thank you Harald for bringing tip lift/dorsiflexion to our attention. As you say, it doesn't matter so much whether the tip actually lifts off the snow. What matters is the dorsiflexion movement and its effects higher up the kinetic chain. Big improvement potential in my skiing from a very small movement. Based on a couple of questions I've had I think there may be some confusion about the the history of flexing the ankle (dorsiflexion) in PMTS. I haven't been studying PMTS long enough to know when Harald first started teaching it, but the movement of flexing the ankle (dorsiflexion) was part of the program before I started my PMTS journey. 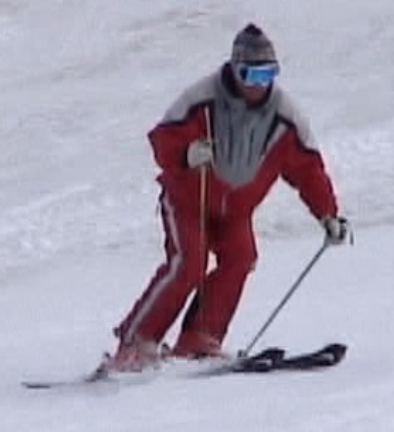 Keep your body over your skis as you start moving with them. 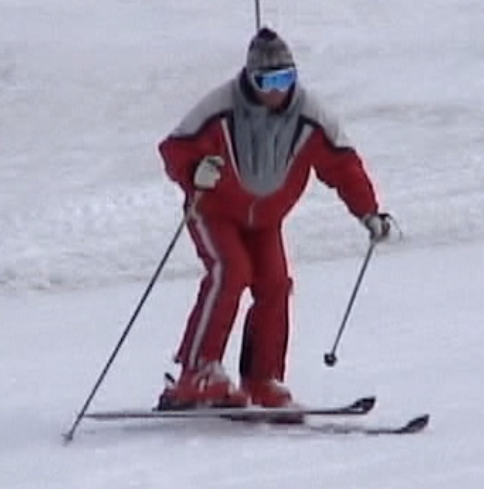 Maintain slightly flexed ankles and knees to remain centered on your skis. Feel your shins in contact with the front of the boot, but avoid leaning on the front of the boot for support. Keep in mind that HH has said many times that readers of the ACBAES books should read carefully to pick up the details. For example, on page 64 of book 2 under the "Hold the Free Foot Back" heading is the following: Flex that ankle and pull the free heel back under the hips. If you follow HH's instruction (red text) when making a phantom move there's a chance the tip will lift first, even in relatively low energy turns. In higher energy turns with a big flex the tip is more likely to lift. The problem is that some students still weren't dorsiflexing. Luckily for us, Harald is constantly thinking of new ways to make it easier for his students to master the movements and the instruction to lift the tip first is the outcome of that incredible dedication to his students. The tip lift is a brilliant external cue because if we flex the ankle to lift the tip then we will have enough dorsiflexion as we transition in addition to the other benefits Harald writes about on his blog. How does this new movement of the slight tip lift in the phampton move apply in the bumps? skijim13 wrote: How does this new movement of the slight tip lift in the phampton move apply in the bumps? We don't change technique when terrain or conditions change. Max_501 wrote: Based on a couple of questions I've had I think there may be some confusion about the the history of flexing the ankle (dorsiflexion) in PMTS. I haven't been studying PMTS long enough to know when Harald first started teaching it, but the movement of flexing the ankle (dorsiflexion) was part of the program before I started my PMTS journey. Jim, I'm sadly familiar with the problem of the new inside ski tip getting out ahead in bumps. It blocks the ability to move into the new turn, leaving the skier playing "catchup", which leads to a late twist and skid. The dorsiflexion PMTS is talking about is completely different. Looks different. Feels different. 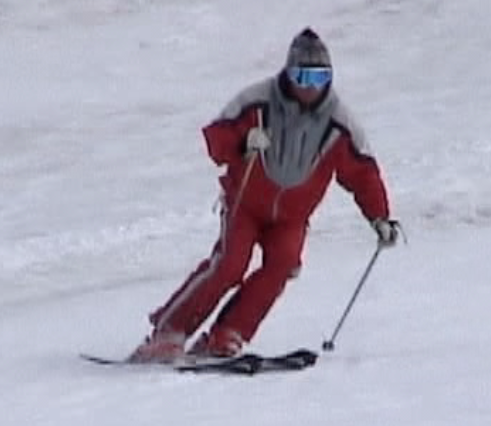 It in no way causes the kind of tip blocking problem that happens when skiing bumps with TTS technique. I didn't look for a bump run when trying this the other day, but I did hit a few bumps on the last couple free skiing runs. As Max suggests, the dorsiflexion worked exactly the same as it did on a groomer... faster release, better balance transfer, quicker & more stable base for beginning the new CA & tipping. This is different from the tip pushing ahead problem that results from TTS extension to release. rwd wrote: Should we also add: Whenever you pull back, dorsiflex? It sounds like this is a new addition, but as posted with photos, it's been there all along. I'm going to be teaching tomorrow, so I'll give this a try. Also looking at the photos, as the tip then ski comes up, there isn't much "O" frame. As in the Super Phantom, where the LTE is held until the free foot is tipping, and then released. Looking forward to working this out and seeing how it goes. I can just imagine what my CSIA colleagues will say, if they even notice it. Thanks for the in depth photos and analysis. 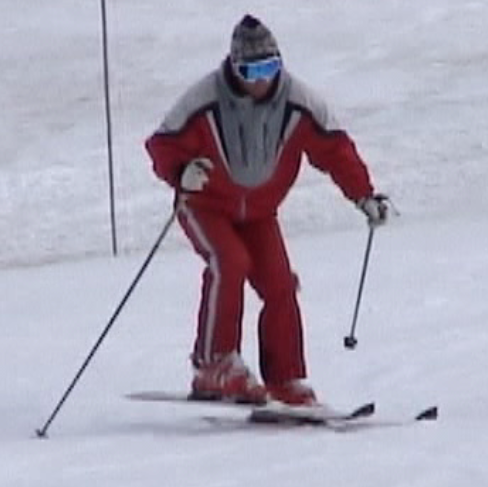 Seeing it in the pros, and again in HH's skiing shows how closely and totally relevant PMTS is. Truly cutting edge! Doug, I will have to try it in the bumps the move works great in the groomers and has eliminated my excessive tail lift. Our bumps at our mountain are icy and planted only for zipper line skiing, so I will try it on nicer bumps first. The reason I asked the question in the Video series done by Dianna in the learn to ski video for bumps, at a closer look before the tail lift I see the dorsoflexon of the ankle causing a slight tip lift. So much to learn in PMTS I need another 100 years.